Introduction.—In America the practice of agriculture, as presently carried on, is in the main as primitive and simple as it was in Scotland two hundred years ago. The means by which that simple work is executed are certainly far superior to those at the command of our forefathers eight generations back. America is ahead of all other countries in the world in labour-saving machinery; but the practical every-day manipulation on an average American farm is as elementary and simple as in Scotland at the period referred to. American farmers plough, and sow, and reap, and heed neither the principles of rotation nor the science of manuring. Their management of live stock, too, is as simple as ever it has been in Scotland. And yet this new country throws Scotland far into the shade by the efforts it has been making to disseminate throughout its bounds scientific agricultural education. It recognises that though so long as the soil retains its virgin richness, farmers may thrive even by the primitive, simple system of farming that now prevails, the day is not far distant when American agriculture, like agriculture in Britain and in other-long settled countries, will demand the aid of science; and so, looking beyond the actual wants of the time, and discarding the maxim that sufficient unto the day is the evil thereof, Americans (the inhabitants both of the United States and Canada) are making a bold, liberal, and intelligent effort to train up a race of farmers that may be able to grapple with the stubbornness of the soil when it becomes weary of its present well-doing and refuses to yield profitably without "priming." Undoubtedly such stubbornness will come some day. In an old fully developed country, where every small grocery business seems as safe to its heirs apparent as an entailed estate, few regard agriculture as the essential basis of true national prosperity; but in America, whose manufactures and commerce are still in process of formation, every one feels that without a sure foundation in agriculture, these commercial fabrics would be frailty itself. How true are those eloquent words of Daniel Webster, the great American orator, "Agriculture feeds us; to a great extent it clothes us; without it we could have no manufactures, we could have no commerce. These all stand together, but stand like pillars in a cluster, and the highest is agriculture." Michigan Agricultural College was opened in May 1857, and is situated on the Red Cedar River, in the suburbs of Lansing, the state capital of Michigan. The college grounds in all extend to 676 acres, of which 300 are under regular cultivation. For four years the institution was under the management of the State. Board of Education, but since 1861 it has been controlled by the State Board of Agriculture formed for the management of the college. The Act of 1862 gave to this college 235,673 acres of land, of which a little over 72,000 acres have been sold, yielding $231,670 (£56,334), the interest of which at seven per cent. is applied to the support of the college. First Year.—First Term.—Algebra, History, and Composition. Second Term.—Algebra completed, Botany, and Agriculture. Third Term.—Geometry, Botany, and French. Second Year.—First Term.—Geometry, Elementary Chemistry, and French. Second Term.—Trigonometry, Surveying, Organic Chemistry, French. Third Term.—Mechanics and Analytical Chemistry. Third Year.—First Term.—Mechanics, Drawing, Agricultural Chemistry, Horticulture. Second Term.—Entomology, Physics, Rhetoric. Third Term.—Astronomy, Meteorology, English Literature. Fourth Year.—First Term.—Physiology, Agriculture, Mental Philosophy. Second Term.—Zoology, Geology, Botany, U. S. Constitution, Moral Philosophy. Third Term.—Civil Engineering, Political Economy, Landscape Gardening, Logic. 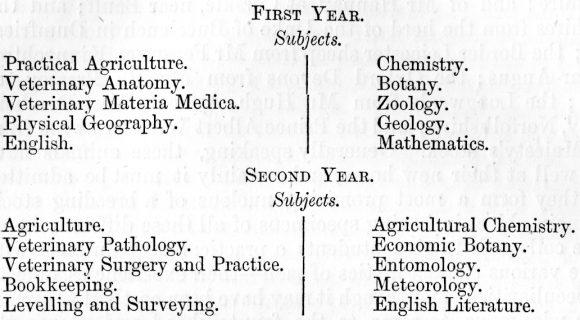 The subjects discussed in the lectures on Practical Agriculture which are delivered to students of the first year are the general principles of drainage; laying out and construction of farm drains; and sewerage of buildings; principles of stock-breeding; breeds of domestic animals,—their characteristics and adaptation to particular purposes. And then the fourth year's students receive lectures on the History of Agriculture; on the principles of farm economy; mixed husbandry; rotation of crops; relation of live stock to other interests of the farm; feeding of animals; management and application of manures; planning and construction of farm buildings; farm implements; cultivation of farm crops; special systems of husbandry. The lectures on Agricultural Chemistry refer to the formation and composition of soils ; the relations of air and moisture to vegetable growth; connection of heat, light, and electricity with growth of plants; nature and source of food of plants; chemical changes attending vegetable growth; chemistry of the various processes of the farm, as ploughing, fallowing, draining, &c.; preparation, preserving, and compositing of manure; artificial manure; methods of improving soils by chemical means, by mineral manures, by vegetable manures, by animal manures, by indirect methods; rotation of crops; chemical composition of the various crops, and the chemistry of the dairy. The lectures on Botany make pointed reference to the relation of that science to agriculture, and include the study of all agriculture grasses and plants. In the course on Physiology very special attention is bestowed on the anatomy and physiology of the domesticated animals, and actual dissections of animals are made in presence of the students. An examination takes place at the end of each study; and unless the student makes seven marks out of a possible of ten at the concluding examination, and an average of five at the stated examinations during the term, he is not recorded as having passed. Each student, unless physically disabled, is required to work three hours per working-day, excepting Saturday, on the farm or on the garden; and remuneration is allowed according to ability, the maximum rate being 10 cents. (fivepence) per hour. The arable part of the farm—300 acres in extent—is worked under a regular six-course rotation of Indian corn, turnips, oats, wheat, and clover; while a series of experiments are being constantly carried on with the view of "educing principles which lie at the foundation of agriculture." All these operations the students have to witness and aid in, under the supervision of the Professor of Practical Agriculture. Specimens of the different breeds of cattle—Shorthorn, Hereford, Devon, Ayrshire, Galloway, and Jersey; of Southdowns, Cotswold, Lincoln, Spanish Merino, and black-faced sheep; and of Essex, Suffolk, Berkshire and Poland China swine, are kept on the farm with the view of providing to students an opportunity of becoming acquainted with the characteristics of all these various breeds, and with the view of illustrating what is taught in the class-room. The buildings include a very fine chemical laboratory, containing experimenting tables for forty students; as also an excellent library and museum, the former containing about 4000 volumes, and the latter about 5000 models of mechanical inventions relating chiefly to agricultural manufactures and engineering. The staff at present consists of a Professor of Mental Philosophy, who is also President or Rector, a Professor of Chemistry, a Professor of English Literature, a Professor of Zoology and Entomology, a Professor of Botany and Horticulture, a Professor of Practical Agriculture, and a Professor of Mathematics and Civil Engineering, and seven assistants. The salaries of these Professors amount to from 1000 to 2000 dollars, or from £200 to £400 per annum, the President having 3000 dollars or £600. The number of students in attendance is about 150, and since the college received the land grant in 1862, 123 have graduated, The degree of Bachelor of Science is conferred upon all students who go through a full course and sustain all the examinations; while the degree of Master of Science is bestowed upon those graduates of three years' standing, who give evidence of having during that period made a proper proficiency in scientific studies. Education is free to all students, and board and washing are furnished at cost. A fee of 5 dollars (£1) is charged for matriculation, and a similar fee for graduation; while students in analytical chemistry have to pay 2 dollars (8s.) the second term, and 10 dollars (£2) the third term for their outfit in the laboratory. Each student is charged 1 dollar and 25 cents (5s.) a term for room-rent, and has to provide himself with all necessary furniture except bedsteads and stoves, which are afforded by the college. The college accounts for 1875 show the revenue for that year to have been 53,375 dollars or £10,675; and the expenditure 53,115 dollars or £10,623. Ontario Agricultural College.—Though slower in moving in the matter than the United States, Canada has at length bestowed practical attention on the disemminating of scientific agricultural education. Four years ago the Government purchased a farm extending to 550 acres, and situated about a mile to the south of the town of Guelph, in the Ontario province, and converted it into a "School of Agriculture and Experimental Farm," with the view of giving a thorough mastery of the practice and theory of husbandry to young men of the province engaged in agricultural or horticultural pursuits, or intending to engage in such; and conducting experiments tending to the solution of questions of material interest to the agriculturists of the province, the results of such experiments to be published from time to time. The college was opened in May 1874, and already a good beginning has been made, though as yet of course little real substantial work has been accomplished. Buildings have been erected to accommodate about a hundred students, and the farm, 400 acres of which are clear, has been greatly improved; while the facilities for imparting scientific and practical education have been considerably increased and are now pretty complete. The farm has been divided into five departments, viz.—1, Field department; 2, live stock department; 3, horticultural department; 4, mechanic department; and 5, poultry, bird, and bee department, with a foreman or instructor for each of the first four. The farm has been provided with an extensive stock of implements, including all the latest and most improved inventions; while the live stock department consists of from three to ten of each of five different breeds of cattle, viz., Shorthorn, Hereford, Devon, Polled, and Ayrshire; of a few of each of four different breeds of sheep, viz., Leicester, Cotswold, Dereham, Longwools, and South Downs ; and a few Berkshire and Windsor swine; and of sixteen or eighteen farm horses, rather better than the general run of farm horses in the Dominion. The majority of the cattle and sheep and a few swine were imported from England and Scotland in the summer of 1876 by Mr William Brown, Professor of Agriculture at the College. They were selected from the following herds and flocks and bought at high prices, viz., the Shorthorn from Her Majesty's herd at Windsor, and from Mr Campbell's herd at Kinnellar, Aberdeenshire; the Herefords and Devons also from Windsor; the Polled cattle from the herd of the Earl of Fife, at Duff House, Banff; of Mr Farquharson, at Haughton, Alford, Aberdeenshire; and of Mr Hannay, at Corskie, near Banff; and the Ayrshires from the herd of the Duke of Buccleuch in Dumfriesshire ; the Border Leicester sheep from Mr Ferguson, Kinnochtry, Coupar-Angus; the Oxford Devons from Mr H. Brassey, of Oxon; the Longwools from Mr Hugh Aylmer, West Dereham Abbey, Norfolkshire; and the Prince Albert Windsor swine from Her Majesty's stock. Generally speaking, these animals have done well at their new home, and certainly it must be admitted that they form a most promising nucleus of a breeding stock. The main object in having specimens of all these different herds at the college is to give students a practical acquaintance with all the various characteristics of each—their excellencies, defects, and peculiarities; and though it may have been costly it assuredly was a wise move to come to the fountainhead and secure the best animals to be had for the purpose required. It can hardly be said that the same care and enterprise have characterised the selections of stock for all the United States colleges; and no greater mistake could be made than to illustrate lectures on the characteristics of a certain breed by an untrue or unfavourable specimen of that breed. A portion of the land has been set aside as an experimental farm; and already a series of experiments on a great many varieties of grain, roots, and grasses, under different treatment regarding cultivation and manuring have been begun, and have thus far gone on satisfactorily. The whole work of these experiments has to be executed by the students, under the superintendence of the professors of agriculture and chemistry, one of the students being selected each year as responsible overseer of the experiments. Important experiments are also conducted in the feeding of live stock. The curriculum or course extends over two years; and students must be fifteen years of age before they are admitted, and able to pass an examination in ordinary elementary education, or what is known as the three R's in this country, and also produce a certificate of intention to follow agriculture or horticulture as an occupation. Students who cannot pass the entrance examination are admitted, if desired, into a preparatory class in which they are taught for a year on ordinary elementary subjects, including farm and garden work, if they have hitherto had no knowledge of these occupations. The course of apprenticeship consists of practical instruction in all the four principal departments of the farm—the field, the live stock, the horticultural, and mechanical departments—the instructor of each department or his assistants accompanying the students, who are distributed alternately to each branch, so that in the course of the two years they obtain a thorough insight into all matters connected with these four departments. There are two sessions in each year—a winter session, beginning at the first of October, and a summer session, commencing about the middle of April—each session being followed by an examination and a short vacation. Diplomas are given to all students who complete the required course satisfactorily, and negotiations have been opened with the view of having these diplomas or degrees issued by the University of Toronto. Here, as at the United States colleges, tuition is free, while students receive board and washing at cost. It is preferred, but not required, that students should reside at the college. Students who take the regular course have to work an annual average of five hours per week day in either of the four departments of the farm, and for this they receive remuneration to the extent of 10 cents, or 5d. per hour. This labour system has many great advantages, and one of the most important is that it reduces the cost of education at the college to a very small amount. It is calculated that at the most the cost of the whole two years should not be more than 100 dollars, or £20. An industrious student, with a fair knowledge of practical farm work, might almost pay his way through. The staff at present consists of a President or Rector, who is also Secretary and Bursar; a Professor of Agriculture, a Professor of Chemistry, a Professor of Veterinary Science, an instructor in the farm department, an instructor in the horticultural department, and an instructor in the mechanical department. Up till last autumn (1877), when a large addition was completed so as to bring the capacity up to 100 students, the college buildings could accommodate about 40 students. Every room was then filled, and there is little fear that the greatly increased accommodation now provided will be found unnecessarily large. In fact, the buildings are already taxed to their utmost, no fewer than 100 students being enrolled for the winter session of the present year (1877), which begins on the 1st of November—a month later than usual, owing to the new buildings not having been finished sooner. The financial side of the subject is not the least important. From the experience already obtained, it is quite evident that the farm will be self-supporting, and, as previously stated, students pay for their board and washing, so that, once everything has been got into proper working order, almost the only item to be placed on the maintenance account will be the salaries of the staff and wages of assistants, which at present amount to 8760 dollars, or £1752 per annum. Mr Johnston, the able and energetic President of the College, assured the writer that once the college and farm were fairly established, he believed he could carry on the institution with an appropriation of about 10,000 dollars, or £2000 per annum. The cost of maintenance (including experiments, salaries, and wages) in 1876 amounted to about 17,000 dollars, or £3400; and it is estimated that the appropriation expenditure for this year (1877) will amount to about 500 dollars, or £100 more. In mid-summer (1877) the writer had an opportunity of seeing into the working of this college and its farm very fully, and it was indeed wonderful and gratifying to find everything moving on so systematically and efficiently in an institution which had only recently entered the third year of its existence. The staff seem most efficient, and work harmoniously together towards the same good end—the complete success of their institution. The students were employed mainly at outside work—some cutting and gathering pease, some carting, some tending to live stock, some gardening, some engaged among the experimental plots, and some handling the plane, saw, and chisel in the mechanical department. The tone throughout seemed healthy and promising. Indeed, one could not fail to see in this youthful institution the foundation and beginning of a seat of agricultural learning that will be a boon, a blessing, and an honour to the great country that gave it existence. Short as the history of the college is, it is not altogether without the stamp of discontent. A few impatient citizens of the Dominion have been grumbling because the college has as yet "done no good to the country." It has a great work to accomplish, which, like all great works, can be accomplished only by slow degrees. Scientific Agricultural Education in Scotland.—Thirty-eight Agricultural Colleges in the United States! How many in Scotland? Surely it must seem to every one a little strange that that region of the globe where agriculture has become most truly a branch of science should, of almost all civilised nations, be the most devoid of means for imparting scientific agricultural education. No country in the world stands more in need of a knowledge of science as it relates to husbandry than Scotland, and yet few countries have less of it, or so little means of obtaining it. "With a large and constantly increasing population, and but very limited scope for extending either our arable or exclusively meat-producing areas, we must do either of two things—send our money into foreign countries for meal and meat, or bring more out of the acres we have got. The latter course ought to be ours. Increased acreage production has become an urgent necessity if land in Scotland is to maintain its value to its owners, and Scottish farming remain a remunerative profession. Farming in Scotland has changed greatly within the past twenty years. The farmers of to-day have to contend with rents greatly advanced and still increasing, with labour bills doubled and probably not yet at their maximum, and with manure accounts tripled and still growing; while, on the other hand, their receipts for grain have remained almost steadfast, and those for beef and mutton, which for a time advanced satisfactorily, seem at last to have reached their highest point. To be sure, a little more may yet be done in many localities, by the better exercise of the knowledge and appliances now at the command of the farmer, but there are mysteries in the tillage of the soil and the management of live stock that science alone can unlock for him. There are treasures in the soil and in the animal which are not made visible to him by his elementary "binocular," and which can be revealed to his sight only by chemistry and physiology—treasures which, if he is to maintain an advancing rent, increasing labour and manure bills, and his position in society, must yield to him their richness and substance. The encouragement given to the study of scientific agriculture by the Highland Agricultural Society has already done much good, and will still do more; and so also will the laudable efforts of the North of Scotland School of Chemistry and Agriculture, recently established at Aberdeen. Both these movements are good as far as they go, and their promoters deserve all honour and praise for the service they have rendered to agriculture. But neither of the two meets exactly what is wanted by the general body of Scottish farmers. The classes conducted in Edinburgh, taking living and everything into account, are too costly for a very large number of farmers' sons, and, of course, the valuable bursaries offered by the Highland and Agricultural Society can aid but a very few. The institution in Aberdeen, again, has still greater defects, and though it is merely of a tentative character,—merely a small beginning,—a foundation on which much is intended to be built, it would be well not to allow its inefficiency to lie unnoticed, lest its energetic promoters should rest too long contented with what they have already achieved. The classes in Aberdeen are carried on in connection with the Science and Art Department, and continue weekly from the 1st of November to the end of March. The course consists of lectures on agricultural chemistry, botany, and practical agriculture, one very good feature being a teachers' class, which was formed as an opportunity for schoolmasters to qualify themselves to teach scientific agriculture in their schools, and obtain the grant given by the Science and Art Department for these special subjects. These classes form an important step in the right direction, but their promoters must not leave them as they are, for they are faulty and insufficient for the end in view in several points. One of the chief defects of the present system is that it practically confines the classes to pupils residing either in the city of Aberdeen, or within a radius of fifteen or twenty miles, for the latter distance is certainly as great as a student could be expected to travel once a week to attend a lecture, lasting for two hours, or perhaps only one hour. A school of agriculture confined to so limited a district is too distinct an error to demand any argument. Far better than the present system of weekly lectures would be the establishment of a "winter session," beginning about the 1st of January and extending over say six weeks or two months, during which lectures should be delivered every lawful day, excepting Saturday, on agricultural chemistry, physiology and veterinary surgery, and practical agriculture, and occasionally, if possible, on geology and botany. An examination should be field once every week, on Saturday, on the three principal branches of study, and at the end of the session, on all the subjects taught, and a list of the order of merit published, each student receiving a certificate according to the grade in which he passed. The compressing of the course of lectures into a short session of six weeks or two months would virtually throw it open to the whole country; and then its inexpensiveness (the whole session might be gone through for something like eight guineas) and the quiet, it might almost be said idle, season of the year at which it would be held, would put it within the reach of all classes of prospective farmers. Another very important advantage of the compressing of the weekly lectures into a regular session would be the more elevated tone which it would give to the instruction provided. The writer has attended both university and science and art classes, that is, every-day lectures and weekly lectures, and was very strongly impressed with the difficulty in keeping up the interest in the subjects taught at the latter as compared with those at the former. But useful as are the existing classes, and as would be the session suggested, they cannot give to Scotland all that it requires in the way of agricultural education. Nothing less than a fully equipped college with experimental farm, such as have been established in Canada, can ever suffice to meet the demands of the country; and surely it is not too much to hope that some day we will follow the good example shown us by our enterprising "cousins" across the Atlantic. No' one, it may be presumed, will deny that Scotland has more need for scientific agricultural education than either the United States or Canada; and if these countries can afford to establish colleges for their young farmers, surely we ought to be able to do so too. It has been said that the agricultural mind in Scotland is not yet greedy enough in its cravings for scientific agricultural education to demand the establishment of a Scotch agricultural college; and if that is so, it certainly is full time that an effort should be made to educate it up to that point. The subject certainly does require ventilation and discussion, and the writer's object is to spread and intensify both. Let our farmers contemplate for one moment what a grand thing it would be for Scotland to have such an agricultural educational institution as that which Canada boasts of; let them think what a benefit it would be for the coming generations of farmers to have within their reach such a thorough professional training as that which has been offered to young agriculturalists in Canada; let them contemplate how much light and shade, and how much of that which is entertaining and attractive to the intelligent mind would be imparted to agriculture by a college training; let them remember that this typical college is not an institution that imparts to young men merely artificial ideas of things, as it is argued some agricultural colleges do, but an institution that combines the practical with the theoretical, an institution where the student listens to lectures the one hour and handles the plough or spade the next, where he can witness experiments, and where, in all departments, studies, and actions, economy rales supreme; let them consider and think over all these and many other points that connect themselves with the subject, and we shall very soon hear from our farmers a unanimous demand for a "Scotch Agricultural College and Experimental Farm." The inauguration of that institution, if we ever reach that stage of intellectual advancement, will be a brilliant event in the annals of Scottish farming.